From the cool breeze that lingers at the start of December to the mouthwatering hamon served during Noche Buena, to the harmonious sound of Christmas carols sung by local choirs, Christmas for Filipinos is a season that ignites all senses. For Filipinos and non-Filipinos alike, there is one element that if not present, turns the yuletide season into just another month in a calendar – and those are Christmas lights. While several manufacturers boast their brand new light models – from traditional mini-lights to the energy-saving LED models – the average Juan or Juanita knows that nothing compares to the timeless glow of the parol. The parol, which means “Christmas lantern” in Filipino, comes in a distinct star shape made of simple materials like bamboo, with frills made of either Japanese or crepe paper. Today, parol makers are more creative, experimenting with different colors and materials. Nonetheless, the parol is traditionally hanged outside as a symbol of shared faith and love. As more homes and establishments hang these Filipino-style lanterns, the parol helps light up streets as stars illuminate the dark sky. While the hanging of a parol is customary in the Philippines, it is a practice not limited to the country. In fact, Filipinos abroad also display these lanterns as a sign of their connection to their homes and to pay tribute to their culture. Because it’s a local product, it’s not easily obtained in foreign soil. However, since it is made out of simple materials, anyone can make a parol, given the proper instruction. If you’re living in California and would like to hang one of these classic masterpieces outside of your home, Pinoy Town Hall can provide a way. 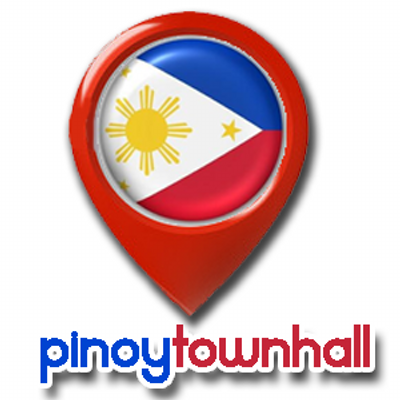 Pinoy Town Hall, in partnership with the Office of the Filipino Ministry, recently held “Parol ng Pinoy,” a free parol making workshop for Filipinos last November 2, 2014 at 370 Campus Drive in Arcadia, California. The event is also sponsored by several Filipino companies and organizations such as Western Union, Philippine National Bank (PNB), and Pilipino Workers Center. If you missed this fun-filled event, worry not. 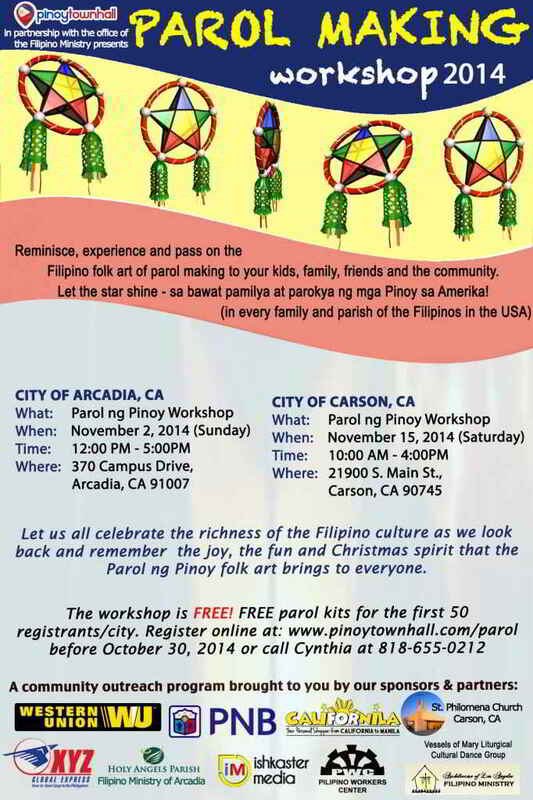 Pinoy Town Hall will be holding another parol making workshop on Saturday, November 15, 2014 at 21900 S. Main Street in Carson, California. The event is for free and as an added boon, first 50 registrants will get a free parol kit. Don’t miss this fun-filled opportunity to re-connect with your cultural roots. Add some Filipino flair to your Christmas celebration this year and join Pinoy Town Hall’s parol making workshop!